Sorry if you missed this drawing. If you have not already subscribed please do so now. 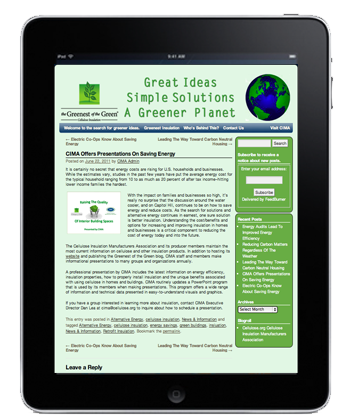 You will get notices whenever new stories and information is posted here at the Greenest Insulation Blog. And you’ll be among the first to know of future promotions. CIMA is giving away an iPad 2 in honor of launching this new web blog. Just enter your email address in the subscriber box, click Subscribe and then follow the steps in the FeedBurner prompt to complete your subscription. It only takes a minute and once done you’re automatically registered for the drawing on October 3, 2011. The winner will be drawn at random from all qualifying subscribers. 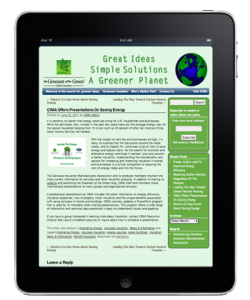 As a subscriber you will receive an email notice when the winner is announced here on the Greenest Insulation blog. You’ll also get notices whenever new stories are posted. One email address registration per person. Must be a current subscriber at time of drawing to win. Notification will be via email to the address provided. This entry was posted in Cellulose Insulation, News & Information, Sweepstakes & Prizes and tagged Cellulose Insulation. Bookmark the permalink. National Fiber Cel-Pak Cellulose is the only product we use for our customers. We love it. I’d love to win A New Apple iPad 2!!! I’ll be teaching an 8 week course in energy auditing, and have recently completed 13 week-long trainings to certify insulation contractors for IL Wx program. We use a mock-up for Wx training and I have ideas for mock-ups for auditor training. It would be great to speak to someone at CIMA about training support you have or concepts you’ve seen that you could share with us. Instructional material such as video or printed material from CIMA are welcome. Best of luck to everyone in the drawing for a new iPad 2! Be sure to check out the other posts and let us know what you think. thanks for the nice contest. Good luck everybody. Thanks for chance to win IPad! Good luck to all.